We knew they taste good, but how well do they 'hear'? The ordinary squid, Loligo pealii, is well known as a kind of floating buffet. “Almost every type of marine organism feeds somehow off squid,” said biologist T. Aran Mooney, a postdoctoral scholar at Woods Hole Oceanographic Institution (WHOI). Not just fish, but also many birds, seals, sea lions, dolphins, and toothed whales depend heavily on squid. Whales, according to Mooney, consume millons of metric tons of squid a year. Even humans get in on the banquet; people eat 3 million metric tons of squid annually. 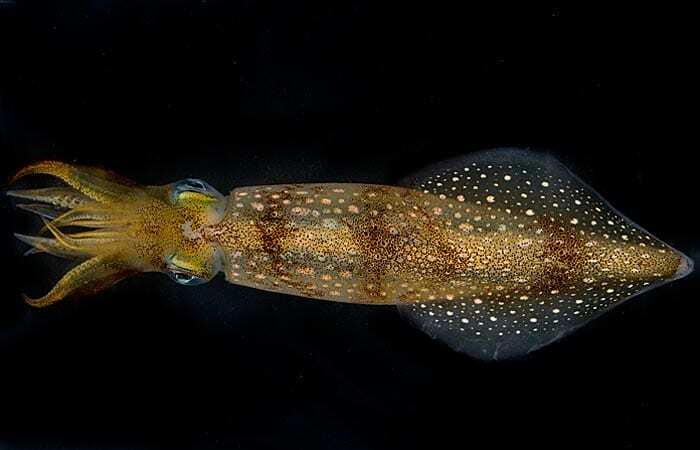 Yet, despite their central importance in the marine food web, it is amazing how little we know about how squid find their way in the watery world—what senses they rely on to navigate, avoid danger, find food, and perhaps communicate with each other. Scientists know that fish, whales, and other vertebrates can hear, but until recently, it wasn’t clear whether squid or other squishy invertebrates could even detect sound. Finding this out isn’t exactly trivial; it’s not as if you can just play a tone and see if a squid raises a tentacle in response. Mooney and colleagues had to develop novel experimental techniques to learn if, and what, squid can hear. In a study published Oct. 15, 2010, in The Journal of Experimental Biology, they confirmed that squid can indeed detect sound. Now, they have begun to investigate a relatively rudimentary sensory organ in squid to see what it can tell us about the evolution of hearing in higher animals. In the well-studied ears of humans, sound waves strike the eardrum and set it vibrating. An array of tiny bones in the middle ear amplifies the vibrations and sends them rippling through fluid in a spiraling tube called the cochlea. The cochlea is lined with hair cells. On one end, they have hair-like structures that project into the fluid in the cochlea; on the other end, the cells connect with nerve fibers outside of the cochlea. The vibrations generate movement of the fluid, which bends the hairs and triggers nerve impulses transmitted to the brain. Squid have two organs called statocysts, which have intriguing similarities with cochleas. Located near the base of the brain, each statocyst is a hollow, fluid-filled sac lined with hair cells. On the outside of the sac, the hair cells are connected to nerves, which lead to the brain. Inside each sac is a tiny grain of calcium carbonate called a statolith. The statolith enables the squid to sense its position in the water. Normally it rests near the front of the sac, touching some of the hair cells. But when a squid moves quickly—as it does when it flees an approaching predator—the heavy calcium stone lags behind slightly before catching up to the hair cells. Structurally, the statocyst “is analogous to our auditory system” and is likely an evolutionary step toward higher-order hearing organs, said Mooney. To test the theory, he and colleagues—Roger Hanlon at the Marine Biological Laboratory, Peter Madsen and Darlene Ketten at WHOI, Jakob Christensen-Dalsgaard of the University of Southern Denmark, and Paul Nachtigall at the University of Hawaii—conducted experiments to determine if the acceleration-sensing statocyst can detect sounds. Mooney and colleagues used a technique similar to hearing tests routinely conducted on newborns, who, like squid, can’t readily affirm that they’ve heard something. In those tests, electrodes are placed on the infants’ heads, and sounds are presented to them through earphones. The sounds stimulate electrical activity in nerves that is recorded by the electrodes. Similarly, Mooney wanted to test whether the nerves coming from squid statocysts send impulses in response to sound. To do that, he had to attach an electrode just under the squid’s skin near the nerves that extend from the statocysts. To do that, he had to anesthetize the squid. That wasn’t as easy as it might appear. Traditional methods to sedate squid lasted only a few minutes, making it hard to study live squid. 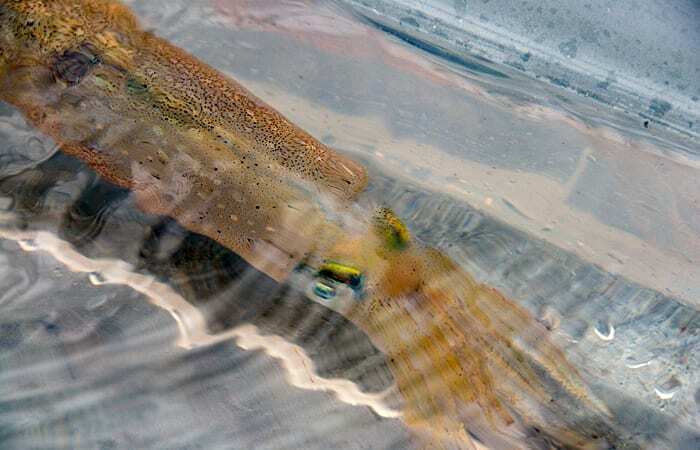 Mooney, Hanlon, and Wu-Jung Lee, an MIT/WHOI Joint Program graduate student, developed noninvasive methods to anesthetize squid for up to five hours. They published their methods in the July 2010 issue of the journal Marine and Freshwater Behavior and Physiology. The new sedation techniques greatly expand scientists’ ability to understand the physiological mechanisms that mean life or death for this critical link in the marine chain. It also enhances the potential for squid to become a valuable “lab rat” to help us learn more about hearing in humans. For their experiments, Mooney attaches an electrode near the statocysts. He inserts another into the squid’s back to get baseline measurements of electrical signals, because that part of the body should not respond to sounds. He then lowers the squid into a shallow, 3-foot-wide tank. In the tank is a speaker that can emit a broad range of sound frequencies—pure tones repeated 1,000 times for each frequency. He then records the 1,000 responses to each tone. By averaging those 1,000 responses, the natural, random electrical noise in the body is reduced, and you’re left with the nerve’s electrical signals, in millivolts, that occur along the nerves after each tone. Mooney said his work falls under the heading of “sensory biology,” the study of how animals use their sensory systems to figure out the world around them. He thinks squid statocysts have a lot to teach us about how ears originated and evolved. Along those lines, his next experiments have involved exploring “hearing” loss in squid. By injecting an antibiotic into squid, he can their disrupt their hair cells and see how that affects the squid’s response to sounds. 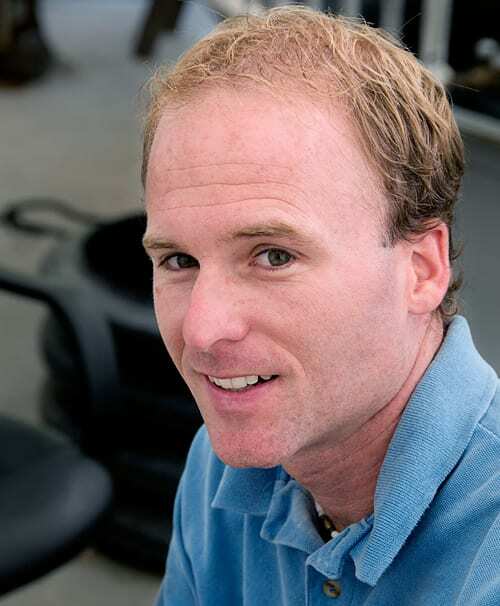 Mooney also wants to pursue whether the burgeoning cacophony of human-generated sounds in the ocean disrupts squid behavior and threatens their survival. Loud sounds, whether sudden like an explosion or continuous like ship traffic, might cause squid to migrate unnaturally just to escape the racket. This research was supported by The Grass Foundation and the Andrew W. Mellon Fund for Innovative Research at WHOI.